The city of Brantford, Ontario, boasts a beautiful, rural countryside in which the charming community of Brier Park resides. 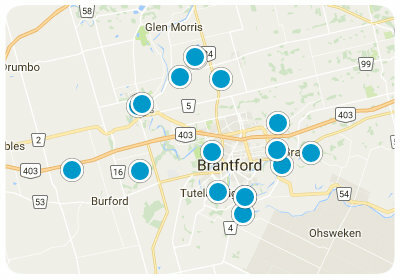 This friendly, cozy neighbourhood is a must-consider for homebuyers looking for a lovely house in the gorgeous landscape of Brantford. Buy a home in Brier Park and enjoy an active lifestyle surrounded by parks, schools, and shopping. Take a stroll through one of the community’s nine parks, while savouring the brisk air and the crunching of the fall leaves beneath your feet. The Brier Park rink, located in the center of the neighborhood, is a place where children and families gather to ice skate during winter seasons while enjoying the company of neighbours and friends. Within the Brier Park community, there is an expansive variety of real estate options to choose from, including semi-detached homes, single-family homes, and larger executive-style homes. Homes in Brier Park are affordable for such a beautiful and convenient location. Single-family homes range from 1,000 to 5,000 square feet of comfortable living space. These homes will charm homebuyers with their well-built and old fashioned brick facades, a beautiful contrast against the rich green foliage in the summer months. Brier Park is a quiet, elegantly landscaped neighbourhood that will keep you in touch with all of Brantford’s many amenities. Brier Park is the perfect community for an active, yet relaxing lifestyle. All in all, Brier Park provides a peaceful setting in the heart of a vibrant community. If you would like more information regarding homes for sale in Brier Park, please allow us to assist you and contact us today.